Sometimes, all we want to do is be there for our loved ones. Whether they’re happy, sad, celebrating, or it’s just one heck of a Monday, we want them to know we love them and we care. Even when distance is keeping you apart, you can be there for them by writing a special set of letters, gifted all at once, with specific times to open them. Now they have your comfort in words when you can’t be there in person, no matter what the occasion, the situation, or time of day. This kit includes 6 coordinating (series 1) writing papers and six assorted preprinted envelopes with the phrase "Open this When." Add on a pool-colored paper mailing box for a more luxurious feel. • you tried something new. • someone in the military. How do I give them? 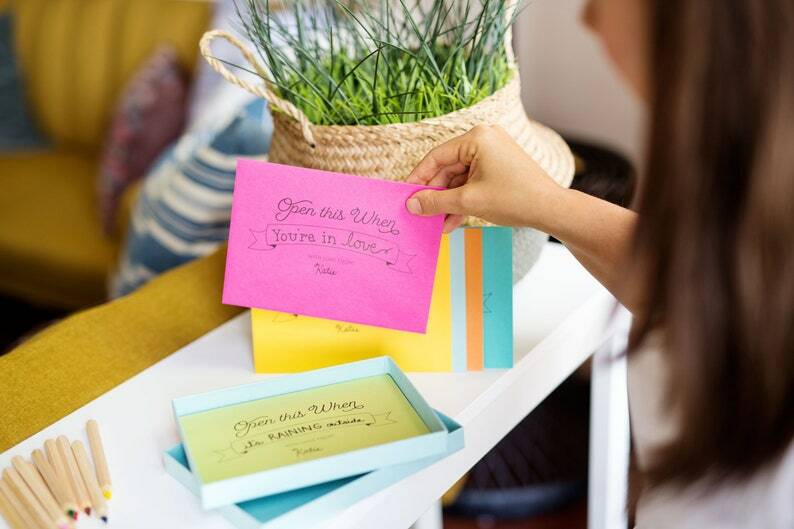 The Polkadot Paper Company designs paper goods and feel good products that encourage women to Celebrate Today, Cherish Yesterday, and Plan for Tomorrow! 6 coordinating writing pages (3 with double-sided designs). 6 assorted pre-printed envelopes with the phrase "Open this When"
Packed in a clear acetate sleeve. Add on a paper box for gifting or storing cards. Our letter writing pages are printed on sturdy card stock so they feel good in your hands and have an uncoated writing surface. Kits are ready to ship via USPS First Class Mail. All designs are ©Polkadot Paper Company® and shall not be used without express permission. Feel free to convo me through Etsy, look me up on Facebook, Pinterest and Twitter or visit my website at www.polkadotpapercompany.com ! I’m happy to answer your questions, design something custom for you, or just say hello! Calendars, password books, and notepads come in a reusable drawstring bag. Colors may vary.